Burnaby, BC, September 18, 2018 – A new survey that shows unsafe driving by parents in school zones across BC during back-to-school has BCAA and Preventable taking action. To drive home the message to stop rushing in school zones, they have temporarily installed a 3D optical illusion of “Pavement Patty”, a child appearing to run across the street in a school zone. A new BC-wide survey conducted last week for BCAA by Insights West quizzed elementary school principals and teachers, as well as parents who drop off and pick up. Results show continued poor driving behaviours witnessed in school zones. 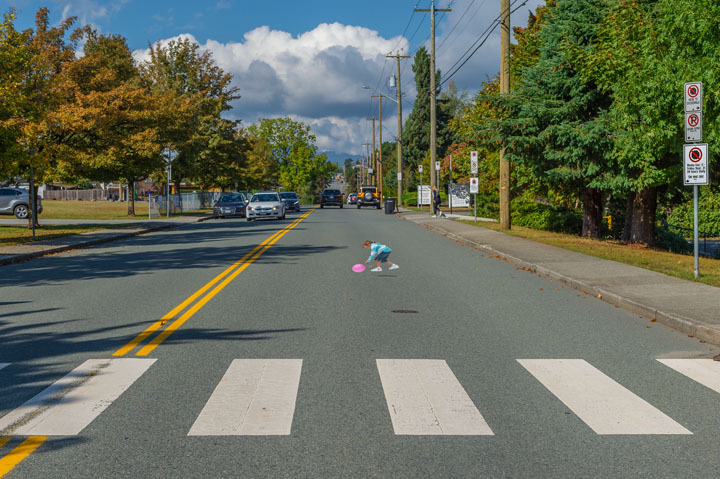 Dr. Ian Pike, Co-Executive Director with Preventable, says that over the past ten years, hospitalizations and deaths among child pedestrians have not changed. “Pavement Patty” is a 3D illusion of a girl chasing a ball into the street, intended to remind drivers to slow down because unexpected incidents can and do happen. She’s installed in the school zone of Brentwood Park Elementary School in Burnaby as an unmissable visual cue to remind parents to take extra care, adhere to the speed limit, and reduce distractions. The illusion is printed in weatherproof, skid-proof vinyl, installed directly on the street. A sign teasing “In a rush at a school zone? Seriously?” first alerts drivers. Then as drivers approach, they see the optical illusion of Patty appearing to cross the street. As she comes into view, she serves as a reminder to drivers to slow down. The illusion made its debut in 2010 and was the first of its kind in Canada. At the time, “Pavement Patty” was highly successful in generating conversation in the community, the local media, and worldwide. “Pavement Patty” is on display in the school zones of Brentwood Park Elementary School in Burnaby until 4:00 p.m., Friday, September 21. Results are based on an online study conducted from September 7 to 10, 2018 among a representative sample of 849 adults in British Columbia, including 207 who currently serve as principals, teachers or school staff at a British Columbia elementary school, or who are parents or guardians who drop off and/or pick up a child from school. The data has been statistically weighted according to Canadian census figures for age, gender and region. The margin of error for the entire sample—which measures sample variability—is +/- 3.4 percentage points. Preventable (also known as The Community Against Preventable Injuries) is a province-wide, multi-partner organization raising awareness, transforming attitudes, and ultimately changing behaviours. The goal of the organization and its partners is to significantly reduce the number and severity of preventable injuries in BC. Preventable’s strategy is based on two years of extensive research to develop a comprehensive understanding of how and why preventable injuries occur throughout the province. Preventable’s work is made possible through the financial and in-kind support of a variety of organizations that continue to sign on as partners in fighting the epidemic of preventable injuries in BC. Now in its 10th year of activity, the campaign is an evolution in Preventable’s ongoing discussion with British Columbians about the epidemic proportions of preventable injuries. The most trusted organization in British Columbia by its Members, BCAA serves 1 in 3 B.C. households with industry-leading products including home, car and travel insurance, roadside assistance, Evo Car Share and full automotive services at BCAA’s Auto Service Centres. BCAA has a long history focused on keeping kids safe on the road and at play through community programs such as its School Safety Patrol, Community Child Car Seat Program and BCAA Play Here. Please visit bcaa.com.